Jed is a zombie or rather cardiovascularly-challenged teen, who's rapier humor helps him challenge the horrors of middle school. There is so much to love about this book: the humor, the very real situations such as fitting in to asking a girl out on a date. Jed's upbeat 'tude to dealing with such things, including Mean boy Robbie and his goons, give us a hero worth cheering for! There's some scenes such as the shower one that show the ugliness of bullying. And Jed is bullied. Robbie even goes so far as pushing the envelope on rearranging certain parts. I think most of us have our own middle or even high school memories that help us relate with Jed's plight. Jed's outlook on life, that being 'different' isn't necessarily bad or wrong, helps him not get too downcast. I love how his parents are his champions in not using the 'different' card to feel down or not worthy. But it's really Jed whose determination, persistence, and yes, amazing humor save the day! 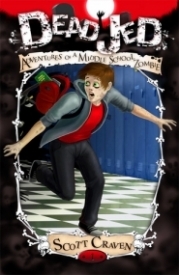 Hilarious adventures of a zombie teen who navigates the jungle known as middle school, this is one story that will resonate with readers.